Sony is offering a firmware update for Digital Photo Frame 'S-Frame' DPF-D70 which was launched in May 2008. If the version is displayed as "1.07", "1.09" or "1.10", update the firmware in accordance with the procedures starting from "2. Preparations for firmware update". The download of the D70_V112.zip 4.89 MB (5,137,994 bytes) file will start. Note: This is the dedicated update file for DPF-D70 only. You cannot use this file with other Sony digital photo frames, such as DPF-D80, DPF-D100,DPF-V900 or DPF-V700. Right-click the downloaded zip file (D70_V112.zip). The D70_V112 folder is now open on your computer's desktop. 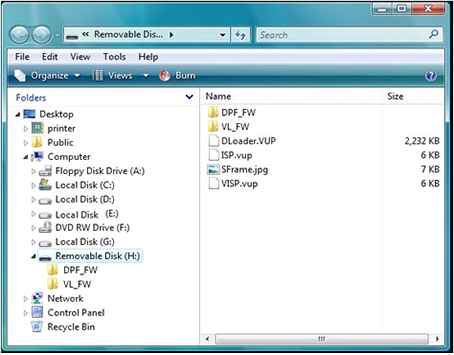 Use a decompression tool to unzip the saved file (D70_V112.zip) to your desktop. After you have unzipped the file, the D70_V112 folder will be created on your desktop. Double-click the saved file (D70_V112.zip). The D70_V112 folder is created on your desktop. We do not recommend initializing (formatting) with a computer, as the DPF-D70 may not recognize the recording medium, depending on the type of initialization format.If you have no choice but to use a recording medium that has been initialized with a computer, copy a JPEG image file and check to see if it is displayed correctly on the DPF-D70. Open the D70_V112 folder on your desktop, and copy the update files inside it to the Memory Stick/Memory Stick Duo. Open the D70_V112 folder on your desktop, and copy the update files inside it to the Memory Stick/Memory Stick Duo that you have inserted into your digital camera.